What's the best bang for the buck on a 40"-50" TV? DVD & Home Theater Gear Discuss DVD and Home Theater Equipment. Location: Gone to the islands - 'til we meet again. I'm doing some reasearch on TVs in the 40"-50" range. To get started, I thought I should see if there was any highly recommended options. Price is a concern, but not the only one. So, what's the best bang for the buck on a 40"-50" TV? I'm guessing it'll be a projection model to keep the price down, but I'm not even certain of that anymore. Dead my living friend, go with a Maxent Plasma. They have Matsushita parts (that's Panasonic to you and me) and are at a great price point. Just make sure to get an x3 model instead of the mx11 models (they are LG parts, not as good). Vizio is also a great bargain in panels. What do you need with a small tv like that? Something for the kitchen or bathroom? OK, seriously...I'd take a look at the Panasonic Plasma ED. Because it is "only" ED it is a good deal and many a folk swear it is better then a lot (most), HD's. Last edited by Sdallnct; 01-23-06 at 04:53 PM. I've always felt people say that because they are bitter they couldn't afford (or just didn't) buy an HD plasma. While it may be true that SD usually looks better on an ED, HD is no competition. There is some thought that past 8-10 feet you can't see the difference, but I can. That said, a Panny ED is a good monitor. However, it's probably past it's technology at this point. And I have alway felt that people who had to have the HD letters on their set were insecure and compensating for something else. As I thought my joke implied, I don't dig those small sets no matter what letters you slap on them. I'm more of a projector guy myself. So it had nothing to do with the money or "that I just didn't". I totally agree...all things being equal, including money, go for the Super Elite Pro SRVX2.11 HD Whatever. But Dead was in fact asking about value which lead me to suggest a good deal was to be had on the Panasonic ED. Since he did not mention a specific price point, I thought it was a safe suggestion. If he does have more money or wants to go in another direction, fine with me. And if he had given more information for his wants, then I might have suggested something different. Since I'm not "up to date" on what's available and the common price points to move up/down in quality, I don't really have one at this point. With that said, I'm not looking for the absolute best TV with no regard to price... maybe suggestions at various price points would be helpful, so I can know what I gain for various price increments . It would be for the family room, where we currently watch regular cable on a 25" set... I'm wanting to upgrade and add an HD connection. m new to this forum, I was myself planning to buy a new TV so was doing some research work……as suggested by sdallnct even I feel that Samsung HL-R5067W 50 DLP HD is a good option I have got some really good reviews for it ……may be it can help you make a decision.....see if they can help!!!! I have the 46" Samsung DLP and love it, well worth the price considering I was housing it in a TV Cabinet and didn't really need ultra thin. Best part is that it only weighs 65-70 lbs so easy to move around if need be. I think DLP is a great technology, the big drawbacks for me however are viewing angle and room lighting. That's why I went with Plasma, as it is not very affected by those conditions. There is a $300 rebate on one of the Panasonic LCD RP TV's. This with some careful shopping should be the total cost under $1,500 which is a pretty darn good deal unless you got the room for a CRT. If you got the room, CRT probably offers the best bank for the buck as many still feel it is overall the best PQ you can get. But you can on;y get the CRT's up to 34", right? Direct view (and you can get 36" models, just not WS) CRTs, yes, but RPCRTs you can get very big (71" or more). Sorry, I was talking CRT RPTV. Excellent "bang for your buck" as they have an excellent Pic (some say still the best available). And they are a good deal as they are so physically big compared to the new technologies. But if you got the room! Do you know of any CRT RPTVs that come highly recommended? I think without a doubt the Mits are the the crowd favorite. However there is also a Pioneer following (I think X has a pioneer). Keep in mind, I have mainly read about them, and did some looking at some higher end HT stores. 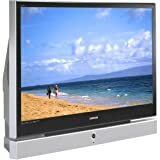 When we moved into our house about 2 years, I was going to get a HD TV for the living room and was looking at the Pioneer CRTRP, but then my wife saw the newer LCD/DLP RP's and wanted to go in that direction due to the physical size. Due to the cost of these at the time, I instead talked her into letting me put together a dedicated HT Room in the back of the house with a PJ. So still using a "regular" 35" TV in the living room, but loving my theater room! Interestingly now that we watch in the media room a lot, my wife want to take another look at getting a new TV for the living room as well. We got new furniture in there recently, so think she wants to "finish" that room. I'm going to try to hold off till Christmas, still lots of other projects to do. Boston would be a pretty long trip for me to buy a TV... it would never pass the WAF test. I replaced the Mits with the Sammy 50 inch DLP mentioned above - I will let you know what I think of it on Saturday when it arrives. It looks like a great set though. My dad bought the 50" Zenith, which got very good reviews from most at the AVS Forum. It's $3000 at Circuit City, but you can pm at Best Buy and get 3 years no interest.